Since chartering in 1972, Peace Arch Chorus (the "PAC") has continued to offer music education to women residing primarily in the Surrey, Langley and Delta communities. We are a proud member of Sweet Adelines International (SAI), a worldwide organization of women singing in the barbershop style. 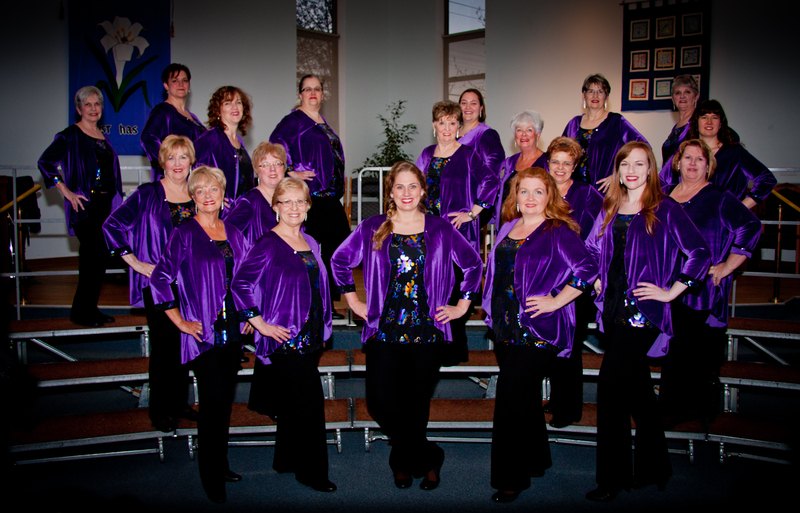 PAC is a wonderful group of energetic and enthusiastic, real women who love to sing. Our talented and effervescent director, Emma Honrud, provides us with on-going musical education in a friendly and encouraging environment. She inspires us to learn during our weekly rehearsals, annual retreat, and expert coaching sessions. Region 26's 2015 chorus competition will be her fist competetition as a director - and we know she'll guide us through the day with skill and poise! The PAC has always endeavoured to give back to the community whenever the opportunity presents. We have been regular Christmas performers at the Fort Langley Olde Fashioned Christmas. In recent years, PAC has performed at retirement homes, fall fairs, July 1st celebrations, and other community events. We are singers who blend fun, friendship, and encouragement into every rehearsal and work hard musically on the barbershop craft. We are hooked on the overtones good a cappella singing creates! Each one of our members sings better now than when they first stepped onto our risers. Musical education has been proven to be great brain exercise, and we love our weekly workouts! 2019 - Surrey, BC - 4th Place Div A Small Chorus - I've Got a Feeling I'm Falling, If I Had My Way. 2018 - Surrey, BC - 2nd Place Division A Small Chorus - I've Got a Feeling I'm Falling, Forgive Me. If you would like to take a look at the slide show presented on PAC's 40th anniversary, click on the link below!